It’s coming along slowly but surely. 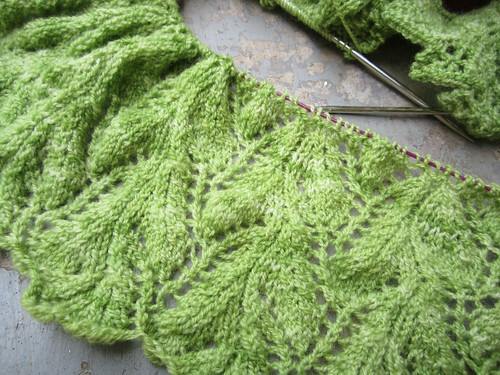 I finished the lacy section of my Twig and Leaf over the weekend and started the short row garter section. It is nice reading and movie watching knitting at this point and I suppose I will be done in a few more days. That will depend of course on how much time I actually get to devote to it. I am really loving how this is coming out and can’t wait to get it off the needles and see it transform when it’s blocked. 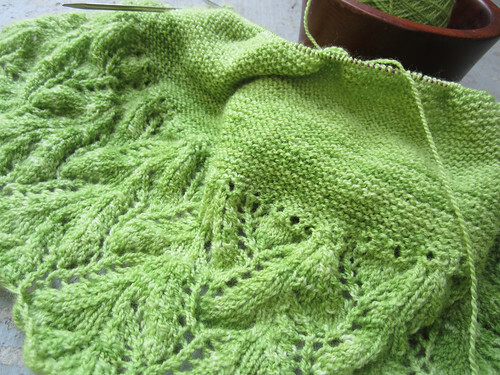 I just love that about lace knitting, don’t you? We are leaving before dawn in the morning for Winchester, VA which is a little over 600 miles. I like to get an early start for long hauls. We are taking along some extra cargo this time. My two youngest daughters are tagging long and will spend the week visiting with my second oldest daughter who lives near Baltimore. They are pretty excited, as are we all. We only get to visit with Heather and her family a couple times a year. Well we see each other on Skype, but in person visits are always more fun. We see them each year when we are in the area for the Shenandoah Fiber Festival and the Fall Fiber Festival of Virginia, and they try to come to Nashville at least once a year, usually at Christmas or New Years. 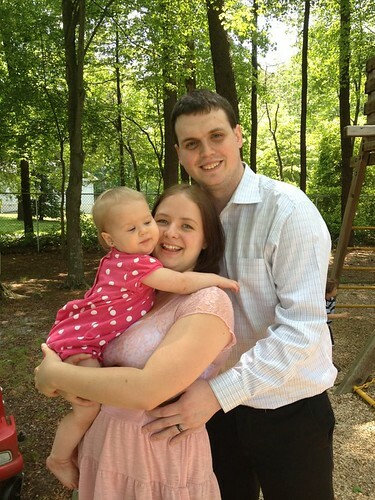 This is Heather, my son-in-law Garrod, and grand daughter Willow this past spring. We are also happy to announce that grandbaby #2 is due in May. :-) Yay! I am also working my way through War and Peace (this translation). It is not a fast read, what with all the foot notes to look up and the French translations to slow me down, but that’s okay. I don’t mind a challenge sometimes as long as I am into the story. I am only about 150 or so pages into it, the whole book including notes is 1400 pages, so haven’t had time to get past the building of the foundations of characters and places. I am getting familiar already though with the major characters. I still refer to the Principal Characters lists to get my bearings sometimes. This is my second time starting this work and it is a personal challenge to finish, and hopefully like it. ;-) The first time I tried was probably 15 years ago. I think the translation just wasn’t working for me. This one is pretty good. I was even inspired with all the French to brush up on mine. I took two years in high school but my skills are rudimentary at best. I got this book on my Nook and downloaded the audio files to my Nexus tablet. I plan to work through it as I can and who knows, by the time I get through with War and Peace I may find I don’t have to look up every French passage, but can translate it myself. :-) We’ll see. I also recently read and listened at the same time to The Children of Hurin. The Audible version was narrated by Christopher Lee and I just can not stop raving about it. It added to the atmosphere of the reading for me to listen to his wonderfully done narration. It was such a big help too to hear the elvish names properly pronounced. The story is sad in places and actually moved me to tears a few times. Okay I better close for now and finish packing. Later!